The My Coach RPE provides physical trainers with an aesthetic, clear and concise interface. Its use is entirely intuitive, and the data collected easily, analysed and interpreted. The application can be configured at any time, and can adapt to the reality of the sports team being monitored. It is possible to change the core questionnaire, modify the results scale (in percentage, to use a value scale…), add a new language, etc. Besides, by creating an outstanding community of fitness coaches, My Coach RPE commits, where necessary, to develop and optimise its application based on feedback it receives from them. Firstly, it registers each member of the sports team’s staff (multiple teams can be managed) to define the individual datasheets. From these the responses to the pre and post training questionnaires will be compiled, along with the date and duration of individual workouts and daily workload for the previous 90 days, in graphic form, divided into common units (dark blue) and individual units (light blue). An athlete can be removed or added at any time in line with any changes that take place in the team. 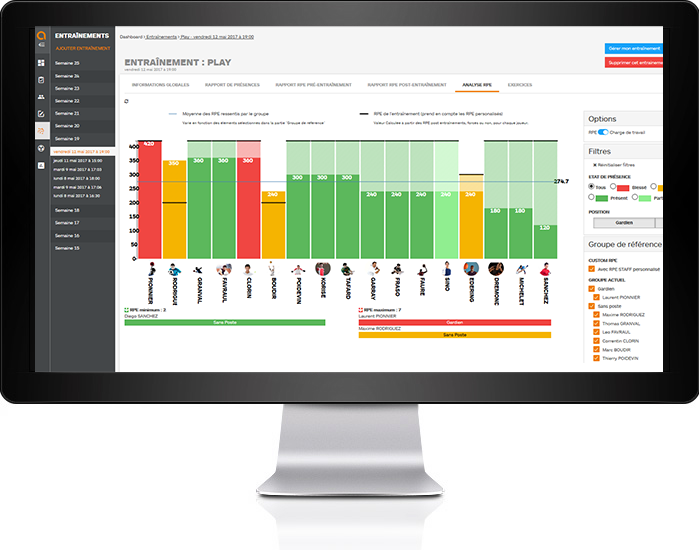 The dashboard, updated automatically, indicates athletes who have reported a particular situation (tired, ill, pain, slept badly…) through the last three validated questionnaires. From the athlete side, answering the questionnaires is a piece of cake. They connect via their smartphone, tablet or device available to them in the training facility by using a code, and in a few seconds and a few clicks enter their responses. The My Coach RPE interface remembers the workouts, with the pre and post information provided by athletes for each one. The information that should alert the trainer is displayed in red, the other in green. The individual and collective strengths and weaknesses will then quickly be identified and the respective workloads quantified accordingly, thus optimising performance. The My Coach RPE application gathers all data relevant to the fitness coach to best assess the physical and psychological form of their athletes. This compilation of elements gathered as synchronised and combined results, is transformed into statistical representation in the corresponding tab. Two very persuasive statistics are displayed. The first is a week by week summary of how the group feels relative to the referent RPE index. Here it is possible to see, at a glance, for each week of training, the gap between the average referent RPE (the average of the coefficients applied by the trainer to their training on a scale of 1 to 10) and the coefficient of how the group feels about these workouts. The ideal is, of course, that this gap is as small as possible, or nonexistent, and that the RPE coefficient can increase gradually over the weeks in harmony with how the group feels. The other statistic is the weekly distribution of work units per athlete. This provides a quick overview of the workload performed by everyone during the course of the week, in collective units (dark blue) and individual units (light blue). These valuable statistics thus present a pertinent mapping of all workouts performed. The trainer, following their own analysis, is able to draw the necessary conclusions and to progressively adjust to the right strategy and implementation. Our advisors are waiting to hear from you.